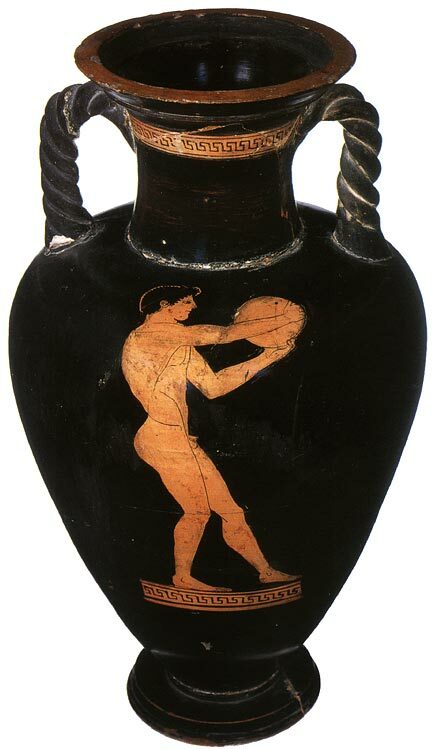 Red-figure amphora (with twisted handles). Attic. Height: 47 cm. Saint Petersburg, The State Hermitage MuseumInv. No. Б. 1852 (St. 1669, Б. 613). Inv. No. Б. 1852 (St. 1669, Б. 613). Unknown; from the Campana collection, acquired in 1862. Side A shows a standing athlete in profile, holding a discus in his hands; the arms are raised and outstretched and the left leg is placed forward. This representation illustrates the swinging movements which precede the throw. Side B features a paidotribe or trainer; his right hand is resting on a pillar (= palaistra) and he is holding a staff in his left hand. He is draped in a himation with his right shoulder bared. The vase bears a graffito. J. D. Beazley, ARV2 (Oxford, 1963) no. 17 p. 183. A. A. Peredolskaya, Krasnofigurnye Atticheskie vazy (Leningrad, 1967) no. 30 p. 36, pl. XXI 2, 3, CLXVIII, 6. © 1993. Photo, text: Olympism in antiquity. Olympic Museum Lausanne. Bertelsmann UFA. Industria Gráfica S. A. Barcelona, 1993, p. 97 cat. no. 40. © Photograph — M. Verhasselt (Brussels-Dilbeek).